My dear friends, we currently are celebrating Deaf History Month in our communities across America and the world. National Association for the Deaf (NAD) proclaimed March 13 to April 15 each year as Deaf History Month. So, with that, I offer you a reflection from Father Ray Fleming, a Deaf priest from Rochester, New York. In the ASL (American Sign Language) interpreter community, at least 80 percent of the workforce are women. Having an ASL interpreter is a vital part of our Deaf Community because our interpreters are there for both you and me. A hearing person who does not sign needs an ASL interpreter, and vice versa. 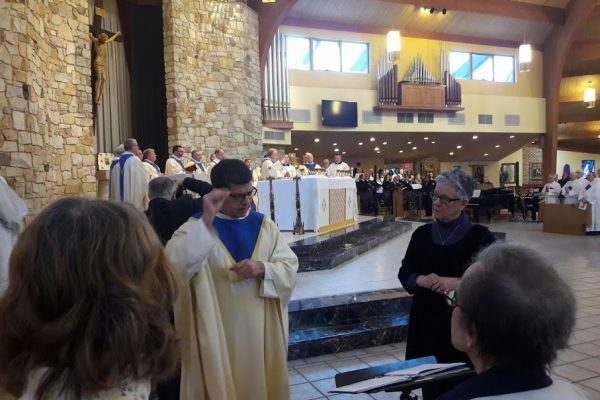 A Deaf person needs an ASL interpreter so they can understand the priest’s words at Mass. Participating in community prayer and reflection, a Deaf person would struggle, feel unsure and not participate in the responses without the help of an ASL interpreter or a signing priest. So if your parish has a request from a Deaf person or their families for an ASL interpreter, please honor that request and make it happen. We are all God’s children. Deaf people see the priest bless the bread and the wine and watch it become Jesus’ Body and Blood. This is the most visual part of the Mass and that moment of love is universal in any language. Giving our Sign of Peace with smiles and handshakes during Mass is also universal. So I invite you to come and see our Deaf Mass at Saint Teresa of Calcutta Parish’s, Holy Saviour Church at 10 a.m. every Sunday. We are celebrating our ninth Catholic Deafest at Good Shepherd School cafeteria, Collingswood, on Saturday, April 6, from 10 a.m. to 3 p.m. with Deacon Patrick Graybill from the Diocese of Rochester. He is a Deaf Deacon and he will give a presentation on “Deaf Catholic Youth Initiative of the Americas.” Deacon Patrick went to Mexico last summer and taught Mexican Deaf youth their faith. Kate Slosar is co-director, Ministry With the Deaf, Diocese of Camden. ******Pictured above are Fr. Hugh Bradley, Co-Director of the Ministry With the Deaf and Persons With Disabilities, and ASL (American Sign Language) Interpreter, Nancy Sullivan. Sorry! We aren't around right now. Leave a message and we'll get back to you, asap. Questions? We're here. Send us a message!